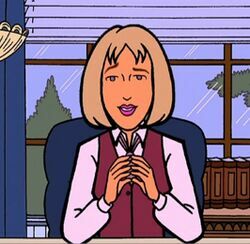 Lisa Goldwin is the Bromwell adminissions officer, voiced by Becca Lish in "Is It College Yet?" Lisa is a pleasant-seeming woman who, in Daria Morgendorffer's disastrous interiew, seems to be trying to put her at ease (though she gets a joke in about Daria wanting to "find your voice, perhaps?") before agreeing to restart the interview. However, she still decides against giving Daria a place after the interview - and gave Tom Sloane (son of alumni) a forty-five minute interview to Daria's fifteen. Sometimes misspelled by fans as "Lisa Goldman". This page was last edited on 26 April 2018, at 21:46.